Well, I certainly took a hell of a couple weeks to fall behind. When I first started this article, it was going to be posted before July 31 and analyze the potential trade pieces. 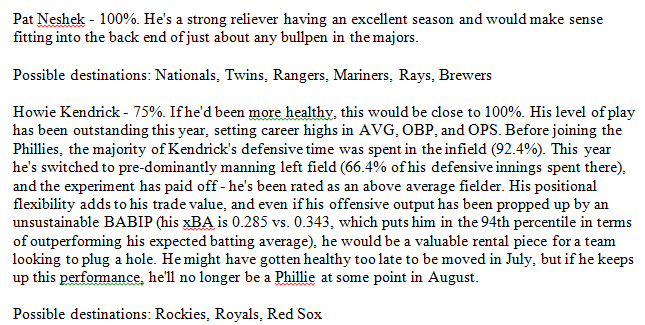 When Neshek and Kendrick were moved early, it caught me offguard and made the writing I had done obsolete. This was a bit demoralizing. Between that and going on vacation, I had fallen behind. Since I had last written – Pat Neshek, Jeremy Hellickson, Howie Kendrick, and Joaquin Benoit were all traded (for mostly low-level minor leaguers with various talent ceilings. Several of the prospects appear on the Phillies top 30 now. The returns were solid, given the pieces traded weren’t all that flashy), they played .500 baseball (7-7, with two of their wins in walk-off fashion), Altherr, Nava, and Andrew Knapp were placed on the DL, Jorge Alfaro and Rhys Hoskins were called up (maybe for good). All of these things pale in comparison to the most important thing that happened during my absence – Darren Daulton, longest tenured catcher in franchise history, passed away at the age of 55. The Phillies posted a video tribute that touches on what he meant to the franchise. I recommend watching it. Game 97: Loss, 4-13. Velasquez finally rejected “the Velasquez triangle”. Tired of only getting to choose two from the array of “strike guys out”, “limit runs”, and “pitch deep”, he decided to choose zero. 3 innings pitched, 1 K, and 4 ER. Jose Altuve, the current favorite for the 2017 AL MVP award, went 4 for 4 (glad I don’t have to say that out loud) with a walk. The Astros absolutely destroyed the Phillies, which should help to convince Phillies fans that if you can endure years of losing, you’ll come through on the other side with a good team. Either that or you’ll continue losing. Game 98: Loss, 0-5. Charlie Morton, briefly a member of the 2016 Phillies, went 7 strong against the Phillies. Or perhaps better put, the Phillies went 7 weak against Charlie Morton. The hitters totaled 4 hits, and half of those were by Cameron Rupp. The Astros scored 4 of their 5 runs in the 6th inning by singling Nick Pivetta to death. It hasn’t been a pretty audition for Pivetta, who’s given up 3 or more runs in 15 of his 18 starts. His strikeout numbers are good, but his walk and home run rates are just flat out bad and need improvement before he can contribute to the team. Unsurprisingly, he has (at time of writing) been optioned back to Triple-A. Game 99: Win, 9-0. Aaron Nola on the mound. Aaron Altherr’s (early) return from the DL. After losing a combined 18-4, these two players helped the Phillies win in a rout over the best team in baseball. Don’t you ever doubt the power of Aaron. Games 100, 101, 102, 103: Win, 10-3; Win, 4-3; Win, 2-1; Win, 7-6. The Braves, aside from playing the Phillies, have been nearly .500 this season. This is surprising considering how many pieces they’ve sold off, but Freddie Freeman has helped to carry this team to near respectability….except that against the Phillies (reminder: worst team in baseball), the Braves have gone 2-11. Even if the Phillies can’t save their own season, they can at least ruin another team’s. 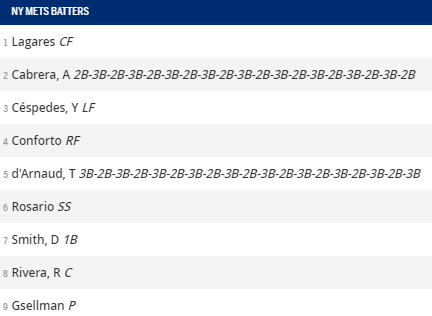 This series featured two walk offs, multiple Altherr homers (still hot!… when healthy), and Vince Velasquez’s finest start yet (7 IP, 0 runs, and 6 K’s). I’d say “maybe he can be a starter after all” except how his next two starts went. We’ll get to that. Games 104, 105, 106: Loss, 1-7; Loss, 0-7; Loss, 4-5. Another series against the Angels means another series of “Mike Trout please come to Philadelphia” posts. It’s no secret that Mike Trout is a fan of Philadelphia sports. It’s also no secret that the Phillies would want him on their team. Frankly, if your team doesn’t want the best player in baseball, find a new team to root for. The Phillies did their best to make Trout feel wanted, allowing him to hit for a 1.715 OPS (with 2 homers). How nice of them. Bright side: Aaron Nola continued his streak of <= 3 ERA starts. Since June 22nd, Nola has the lowest ERA in baseball. I cannot be too effusive with my praise – he’s a building block for the future, and one of the best starters in baseball right now. Game 107, 108, 109: Loss, 3-4; Loss, 5-8; Win, 3-2. Up to Colorado the Phillies went, and down they went in the W-L column. In game 2, Nick Pivetta was hit hard, giving up 8 runs in 2.2 IP. The Phillies would rally late but fall short of a comeback. In game 3, the Rockies were 2 outs away from completing the sweep when Cameron Rupp hit a two-run double to put the Phillies up 3-2. Besides that…well, Cesar Hernandez was great, running a .467 OBP. Overall since his return from the DL, Hernandez has an all-star caliber .915 OPS. I don’t think he’s necessarily someone you build around, but he’s not hurting the team at all. Game 110, 111: Win, 5-2; Win, 3-2. Oh, hey Atlanta. Nice to see you again. Thank you for the victories; too kind, too kind. The “series sweep” makes it 6 straight wins against the Braves. As pointed out by a friend, the Phillies have 43 wins…and 11 of them have come against the Braves. The Phillies have played against 19 teams, and more than a quarter of their wins have come against one of them. They have dominated the Braves. 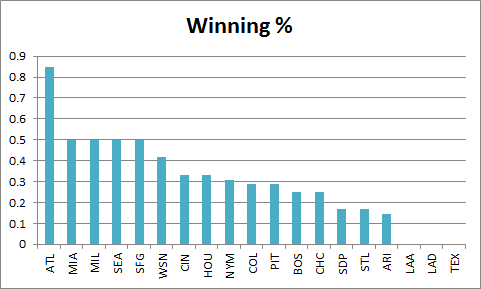 Here’s a look at the Phillies winning percentage vs. each team. Note the only team north of .500. Against the Braves, the Phillies have an .846 W% (137 win pace). Against the rest of the league, the Phillies have a .195 W% (31 win pace). The difference between those paces is 116 wins, or one 2001 Mariners season. Game 112, 113, 114, 115: Loss, 0-10; Loss, 6-7; Win, 3-1; Loss, 2-6. The lone victory was, as expected, with Aaron Nola on the mound. He’s now gone 10 straight starts allowing 2 runs or fewer, the first Phillies pitcher to do so since 1893. Also of note this series – Rhys Hoskins, first baseman (of the future? ), was called up to fill in for an injured (yet again) Aaron Altherr. For all his inexperience in the majors, he’s absolutely torn it up in the minors – so much so that Fangraphs projects him to be the team’s best hitter for the rest of the year. He started slow in his first three games, walking twice in 12 PA. In the fourth game, his family and the rest of the crowd breathed a sigh of relief when in his 15th plate appearance he finally tallied his first hit. While he won’t man the outfield in the long term, he’s been entirely competent in his first few games in left field. The rest of the season will go a long way to determining whether we see more Joseph or Hoskins in 2018. Adrian Beltre, future hall of famer and actually funny baseball player, was told that he needed to stand in the on deck circle during another player’s at bat. He obliged by bringing the on deck circle to him. The Cubs curse, in which they went 108 years without a World Series victory, had an unusual focus on goats. First, there was the curse of the billy goat (Do I really need to educate you on that?). Then, in 2003, it turned from billy goat to scapegoat, as Steve Bartman bore the brunt of the frustrated fanbase. It was undeserved, irrational, and entirely what you would expect from fans at the end of their wits. So when the Cubs finally won a World Series, Bartman must have felt a load lift off his shoulders. The Cubs felt it necessary, then, to counterbalance this by weighing down his ring finger with a world series ring. Move over, Aaron Judge. Giancarlo Stanton is back on top as the king of the dinger. Stanton is red-hot, with 9 homers in August (coming in 8 out of his last 10 games). 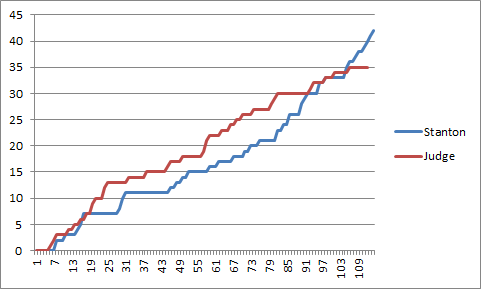 Here’s a graph of their home run race this year. As you can see, Judge had a sizeable lead for most of the year…but that lately, it’s been the Giancarlo show. Wednesday night, the Mets played the Yankees. Their line up was as follows. You might notice something weird. Before the game, Wilmer Flores and Jose Reyes were injured, forcing Terry Collins to play Travis d’Arnaud (catcher), at third. Based on the batter, Collins swapped him with Asdrubal Cabrera. I’m glad that something this weird happened, and doubly so that I’m not the official scorer. < Previous Week 16 Recap: Giancarlo Stanton in Philly?